Jerry boldly insists his dealers give his personal contact information to purchasers of service contract policies at the time of delivery, because he never wants a customer to be stranded with a car problem and have no one to call. He is a tireless worker who can professionally train dealership employees in all aspects of the car business, from the Service Department, Sales Department and Finance Department. Jerry has a wonderful sense of humor, dedication to excellence and the ability to work with anybody. Jerry is one of those rare types who always seems to leave people with a solution to their Automotive problem and a smile on their face. “A deep heart thank-you for all you did to help on Tony’s behalf with getting a refund trough his warranty with Buyer’s Choice. At the beginning, we both felt used and taken advantage of when he had to have transmission work done and it became a mess with being without a vehicle – the main office not returning phone calls to get pre-approval then being denied payment. We were set to get an attorney and cancel the warranty insurance. Until Gary at Legacy Auto’s – where Tony bought the pick-up gave us your name and number and said “IF ANYONE WILL HELP – JERRY IS THE PERSON.” He was so right even though you told us this wasn’t your job – you went beyond and made it happen. Cindy Konold – Very Satisfied Customer! Lindy Konold – Very Satisfied Customer! ” I appreciated so much your polite and concerned manner when I phoned you on Friday, October 15, with my frustration / questions regarding Buyer’s Choice Warranty Company and the transmission repair on our 1994 Dodge Caravan. It was a great deal of help having you as our advocate to work with the repair shop and Buyer’s Choice to come to an agreement (favorable!) on payment for repairs. Not only did the situation work out, but the amount paid was increased I didn’t have to come up with the money First and be reimbursed – as Buyer’s Choice dictated initially. You explained the warranty coverage to me clearly and expedited the repair and payment. It is great to have our Van Back! THANKS SO MUCH to ALL of YOU ! had a major Transmission problem ! 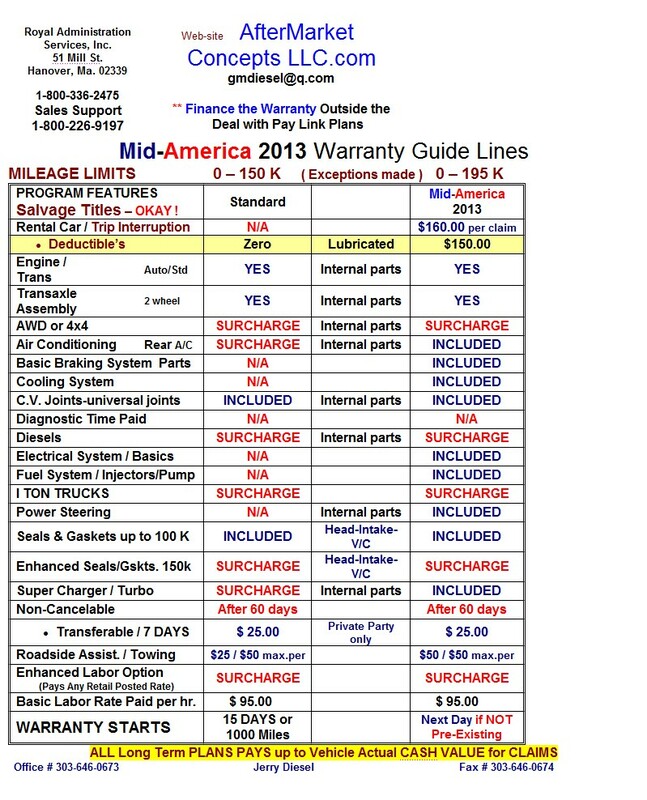 Through all of those problems, I thought AfterMarket Concepts LLC & “Buyers Choice” was going to be like the rest of the warranty companies that I had previously purchased, like Fedelis or Alpha or Elite, which did not help me with my other vehicle & was being so dis- honest when I was trying to get Help ! Jerry Diesel helped me with locating the proper mechanics for the work and Royal Administration Services Inc.
Warranty paid close to $4800.00 for these issues. Buyers Choice has been extremely helpful and honest throughout all of the problems that I’ve had. They’ve never cheated me, as a matter of the fact : they went out of their way to help me when they found out I was a college student and had no family here in Colorado, where I live. Just recently my motor began to run poorly & I had it checked out. It turns out that the crank shaft is vibrating & has caused major lower end problems. Again I contacted Jerry Diesel a real stand up guy and he & the mechanic discussed the motor situation. Jerry then contacted Mr. Chris Amico, one of the main people at Royal Administration, who stood up for me & got me a $3250.00 approval towards this repair ! Jerry has extremely good ties with everyone in the company and they all are the TRUE definition of the word TEAM !! I just want to say Thanks to EVERYONE for the assistance & positive results. Jerry and the staff always gave me ENCOURAGMENT that it was ALL GOING TO BE ALRIGHT ! I’m Not lying, this is a True story ! THESE Guys are THE BEST !! Myself and my S-10 truck want to Thank Jerry with the most sincerity. the next several months. These plans of mine would not have been possible without Mr.
not always have to be undermined or taken advantage of. 3 month or 3,000 mile Plan – to an Extended longer term Plan – these plans allow our Customer’s to have much more faith in their purchase of a used vehicle from us. You provide a great Service to our customer’s and have Helped us with our CSI . We have become more profitable because of you handling the Claims and Questions in such a timely manner and reducing our after sale costs . contracts that your company, Aftermarket Concepts LLC. provide a better list to our dealers that sell aftermarket plans. Designer | Proprietor | A.A.G.G. help my family this year. I’m told that you’re the man who should hear my story. excellent representative for your company. To Jerry and Chris: Thank you, truly. I’m not sure you can understand what a difference this made for us. I promise to “pay it forward” on your behalf. dignity and at an uncommon level, be proud to have them within your ranks. To all involved, thank you kindly and have a wonderful holiday season!